A Compelling mix of Roots Rock and Reggae. No musical genre is more divisive than Reggae among its fans. Apart from a few Bob Marley singles that bridged the divide, Reggae fans are either into Heavy Dub or the poppy Commercial end and never the twain shall meet. 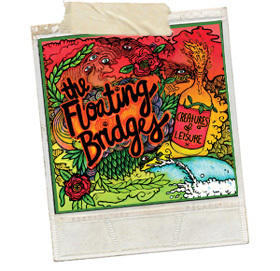 This is the second album from Floating Bridges, who from Queensland in Australia and it errs on the side of UB40 and perhaps the British Ska scene; but with a bit of an edge to their lyrics. The album opens with more of a Jazz-Rock bass-line than I was expecting and a talkover intro leads into a funky tune that owes more to Level 42 than UB40; but is very pleasant and had my shoulders moving in a slow dance stylee. Some pretty exciting guitar opens track #2 Dreamcatcher and carries on all of the way through; and we are definitely in Reggae territory now; with the singer really getting into the heart of the song. I love the choppy guitar on Jennertools and the Ska melody had my toes tapping; and the song itself is deeper than the tune would have you believe. Give it a listen. Traditional Reggae; and indeed Ska, which threads through this album has a rock solid bass line running through it and Floating Bridges manage to pull that off too; although the guitarist may have a Rock background; which actually does the band’s sound no harm at all. For the third time this year I’ve been disappointed when a band have chosen to use the same title for a song as T Rex; but not done a cover version. In this case I genuinely would love to hear a Reggae/Ska version of Get It On! This particular song is a bit Rockier than the rest and the Jah melody that comes and goes feels like an afterthought, rather than an integral part of the song. It’s a similar tale with Home, which closes the album; a good Rock song with a bit of a Reggae melody attached, which doesn’t really do it any favours. With a really good Producer I’m pretty sure this band could create a really distinctive hybrid sound. Combining Reggae and Rock certainly did the Police no harm.